Net Weight: Packet (60 seeds)5lb (10000 seeds) (+$39)50lbs (100000 seeds) (+$356) This item is currently out of stock! Ornamental corn, best known as Indian corn is used for decoration. The large 8 inch ears produce a variety of interesting colors on 8 foot tall plants. For highest yields fertilize 2 to 3 times during the season. When cultivating, pull up soil around plants to help prevent wind damage. Pick ears when husks begin drying. Best when planted in 4 rows at least 6 plants per row for pollination purposes. 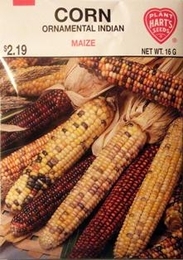 Bulk Ornamental Corn seed available. 2000 Seeds/lb. Plant 1/4lb per 100ft row. 10lbs of Ornamental Corn seed needed per acre.